Speed is a protagonist of your website. A delay of seconds can cause you huge losses like never before. The loading speed of your website is one of the search ranking factors too. Additionally, it curtails your conversions, affects page views and most importantly leaves a negative impression on your visitors. Is you site optimized for speed and performance? You can get the report card for your website at Google Pagespeed Insights. 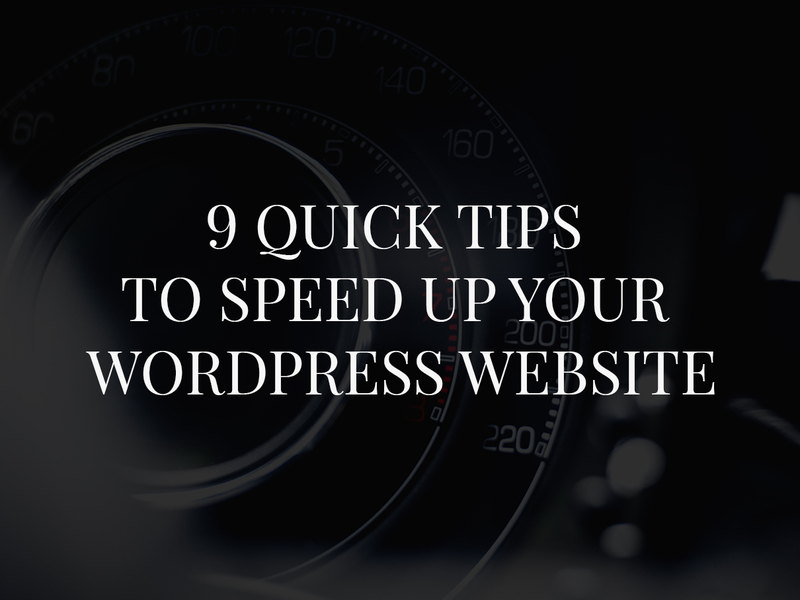 Let’s take a look at some simple steps to improve the speed and performance of your website. First things first. Images form the most important elements on the website. Images define the look and feel of the design and add to the aesthetics. And they utilize a lot of resources too (in terms of disk space). It is thus extremely important to optimize your pictures before uploading because they can consume a lot of the server’s resources. If your images are more than 1 MB in size, then you definitely have to optimize them to boost the speed. Photoshop save for web devices and WordPress image optimization plugins can come in handy. When we talk about optimization, caching is the most important concept. Caching (temporary storage) and reusing previously fetched resources helps in optimizing the websites for performance. In the process of caching, static copies of your page or post are created and the same is displayed to your visitors. So, instead of processing new queries every time, the static pages are displayed which in turn helps in reducing the server load and improves website’s speed. W3Total Cache is my favorite caching plugin for WordPress and here are other best recommendations. Review the plugins installed on your site. Go ahead and delete deactivated plugins. Review the active plugins and see which of them are of utmost importance. Review the active plugins to see which of the functionality can and should be custom coded in the theme. Deactivate the plugins which serve a very little purpose for your site. Cut on unnecessary plugins to improvise the performance of your site. This is also a great security measure for your WordPress website. Keep the plugins to minimum, only keep the ones that are absolutely required for smooth functioning of the site and update them regularly. CDN is a great medium to boost the speed of your website. CDN aids in quick delivery of your static content because content is delivered from the closest location thus improving server response time. For example, if you are located in the US and the host location is India, then owing to distance, the response time should be more. However, CDNs are distributed everywhere, thus when a visitor lands from US then the CDN will serve him to the fullest by delivering files from nearby location (US itself). Thus, CDN boosts your website speed, curtails bandwidth usage and ensures that the content is distributed timely, despite the distance. How much ever alluring your theme might be, you need to evaluate it before installing! If your theme has some lousy code, then no one can help you in boosting the speed unless you change it. Moreover, these themes can be a big hindrance in your SEO practices too. So, scrap them and take advice from your developer while choosing a theme because he is the ultimate ‘tech-geek’. If you are running a WordPress website, saved drafts, revisions, posts, deactivated plugins result in a sloppy database. It’s absolutely necessary to regularly clean-up your database. WP Optimize plugin can help you in cleaning your database. It removes all unnecessary data and runs an automatic cleanup as per your settings and configuration. HTTP or browser compression is one of the efficient ways to improve the speed of your website. This method meticulously helps in compressing your website’s files that helps in saving bandwidth and also boosts speed. This feature compresses website files into a zip file because it is faster for the browser to load. Eventually, the user’s browser unzips the file and displays the content. With this, the transmission is undertaken efficiently and without any hassles. Here is a comprehensive article to help you with enabling gzip compression for your WordPress site. Web hosts play a vital role when it comes to site speed. If you have a decent traffic, then you should be using hosts that will yield long-lasting results. Research properly before choosing a web host. Go for authentic ones like WP Engine, SiteGround, LiquidWeb or better yet choose to host your website on AWS. Google PageSpeed module is an open source server module from Google and immensely helps in optimizing your website speed. It makes alterations to your server and files implementing performance and optimization best-practices. These optimizations are then automatically applied to web pages, images, CSS, at the server before the site is server without causing any hindrance in your workflow or content. Your website is a very important business tool. To get the returns, you need to invest time, effort and money on boosting the performance of your business website. Improving the page speed in one of the critical aspects. Check out our WordPress Speed-up Service if you need help with optimizing the performance of your website.